The military establishment of 1552 needed to be ratcheted up by the demands of repeated campaigns. there are a number of sources which, while they do not always agree in detail, allow a general picture to emerge. These include the general army list drawn up after the German campaign, reproduced by Villars, two closely related lists of the army for the Metz campaign and estimates of the likely garrison of Piedmont. The Villars text is useful for its comprehensive survey of the entire kingdom outside Piedmont, though it lacks precise figures for the infantry. The army was thus listed as: first, the military household, then 1600 lances (notionally 4000 horse), 2940 light horse in 36 companies, 41 companies of `old French’ infantry (c. 12,300 men), 21 of new (6300), 7000 Swiss and four regiments of lansquenets, six companies of scots and one of English. The likely maximum for the infantry is 30,000. The garrisons of the kingdom itself included a further 400 lances, 290 light horse and 43 infantry companies (c. 12,000) with related formations. The garrison of Piedmont can be estimated at the same time 12-13,000 foot and five gendarmerie companies, though the infantry stood at 17,550 (16,000 effectives) in November 1554. The formations thus listed shifted around in the course of the campaign; the Swiss arrived late and were allocated to garrisons in France and Piedmont, as were the bulk of the light horse. the campaign lists for the army after the capture of Metz show around 36,000 men, to which the garrison resources of the kingdom should be added at 11,450 men. This seems to have been the maximum the crown could put together. A figure between 50 and 60,000 would therefore seem to be a good rough estimate for the entire military resources of the kingdom in 1552. the strength of the army for the royal campaign in Artois of August-September 1553 is known both from the detailed figures of Rabutin (9- 9,500 horse and 26-29,500 foot) and also from an official bulletin which suggests 12,000 horse and 30,000 foot. The official account almost certainly exaggerates the numbers of cavalry. In 1557, with one army in Picardy facing the Spanish Netherlands army, another was despatched to Italy, commanded by Guise. French forces were thus again seriously divided. the disasters and triumphs of the year provide a good insight into the weaknesses of the French military machine. Estimates of the army on the northern front are difficult but cannot have exceeded 20,000 foot (French and German) and 6000 horse. at all events, fewer were present at the battle of Saint-Quentin, when a maximum of 20,000 French faced over 40,000 Habsburg troops. 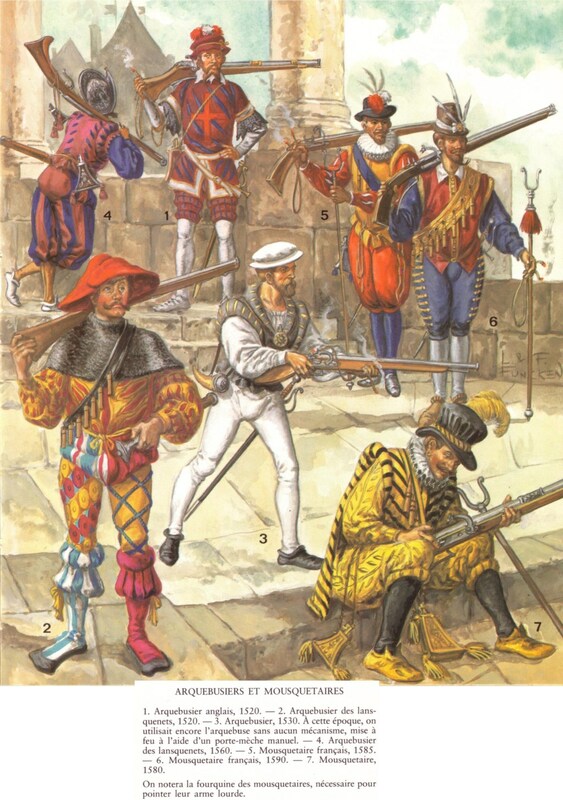 The army of the duke of Guise in Italy consisted of 20 ensigns of French infantry (4000), 6000 Swiss (24 ensigns), 500 men-at-arms in 7 companies and 600 light horse in 4. Piedmont still needed at least a skeleton garrison of 10,000, though some Swiss troops were withdrawn after the battle. Re-equipping the army was vital. Infantry that in other times would not have been considered were recruited, while new armour and arquebusiers had to be rushed to the troops. Ten new gendarmerie companies were created. Guise brought back with him 1400 of his best arquebusiers, 9 French companies (1800) and 2 German and sent 10 more of French (2000) overland with the 6000 Swiss, the gendarmerie and light horse. He was therefore able to provide around 10,000 for the northern front and also to purge some of the inadequate troops taken on in the August crisis. However, there were now about 20,000 foreign troops on hand for whom there was little money to provide pay. Guise’s capacity to assemble a serious army for the siege of Calais was remarkable. a reliable source puts his army at 10,000 Swiss (in two regiments), 6000 lansquenets (2 regiments), an indeterminate number of French infantry (up to 10,000), 500 pistoliers and 500 men-at-arms, 3-400 light horse. An army of around 30,000 foot plus cavalry had been assembled by the end of December to replace that of 20,000 lost at Saint-Quentin. in the aftermath of the defeat of Saint-Quentin, secretary Fresne recorded, a large number of French infantry were raised ‘of whom, though men were employed who at other times would not have been accepted, need made them necessary.’ These then had to be fully equipped with armour and firearms. A company that was drafted to La Capelle early in 1558 was entirely without arms. 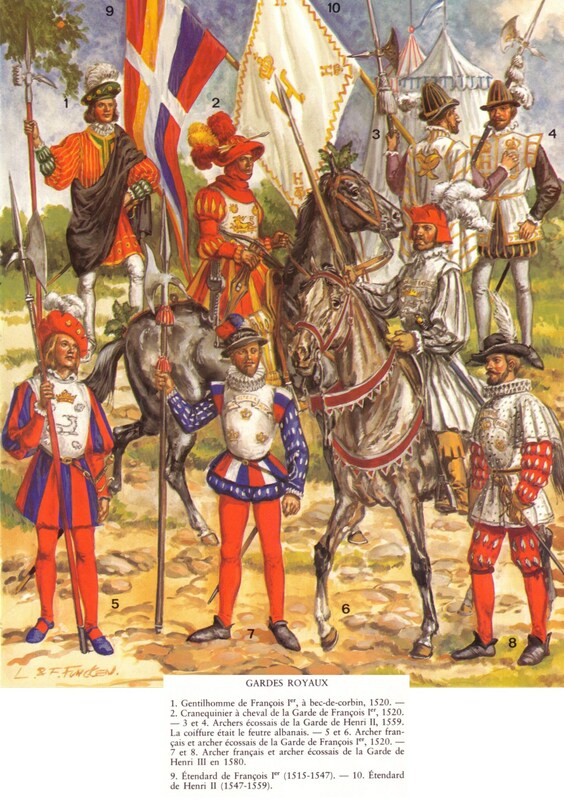 Most observers agreed that the best French infantry of the old and new bands were the Gascons, observed in the Perpignan campaign of 1542 as ‘very fine.’ The reasons for this are still disputable and may be connected to social structures of the Pyrenees region and the frontier status of Gascony. In the crisis of 1557, when the estates of the little province of Comminges, near the Pyrenees, was called upon to find infantry, it certainly made an effective survey of the men with arms available, of whom there was a large number. 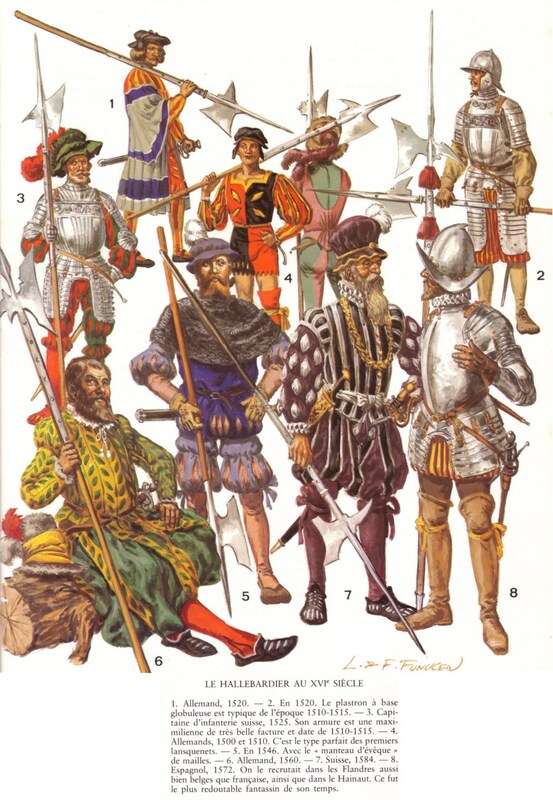 The aventuriers, through the development of the ‘old bands’, had effectively evolved into regiments by the 1540s. The term `regiment’ was applied initially to the Germans in the 1530s but, by the 1540s, many French infantry of the `old bands’ were effectively organised as such. Thibault Rouault was colonel of ten companies in Picardy in the mid-1540s and in Piedmont Jean de Taix commanded a similar formation. When he moved to Picardy, Taix seems to have absorbed Rouault’s command. Coligny had eight ensigns under his command as `colonel’ in Picardy during his campaign against the English at Boulogne. These were soon known as the `Chatillon regiment’ and moved, first, to Piedmont in 1551 and then back to France for the German campaign in 1552. The model taken was the `old bands’ of infantry amalgamated into larger groups like the Italians and German landsknechts (lansquenets). The first clear use of the term `regiments’ for French formations is often thought to be by Monluc, writing of the manoeuvres in Picardy in August 1558. In traditional military history, the creation of `regiments’ (of Picardy, Guyenne etc.) took place the advice of the duke of Guise in 1562, though it is clear that such formations already existed. As for armament, France faced infantry armed with firearms at an early date. Louis XI’s francs-archers in Hainault met German `haquebutiers’ successfully in 1478 and it seems that in the 1470s a proportion of them were armed with spears, halberds and pikes; even some coulevriniers were expected. At Fornovo, the French infantry was covered by arquebusiers. Certainly, the Swiss in French service in Italy in 1500 were armed not only with pikes and halberds but also `hacquebutes.’Brantome, though he thought the French infantry was beginning to improve in the early 16th century, still took the view that at that time they were unwilling to adopt firearms and remained wedded to the crossbow. He thought that it was the shock of Pavia that led them to adopt firearms. The Parisian Nicolas Versoris reported that the defeat of Bayard’s army in Italy in 1524 `happened more as a result of the enemy’s firearms than anything else’ and French troops suffered greater casualties at Pavia in 1525 as a result of firearms. Yet it is clear that the crown was requiring the raising of companies of arquebusiers in the great cities by 1521. An Edict for Paris (March 1524) noted that, `considering … new war industries and inventions’, it was necessary to muster a company of 100 arquebusiers with the same privileges as the guard of archers and crossbow men, with the requirement to train once a week in order to inspire others to exercise. 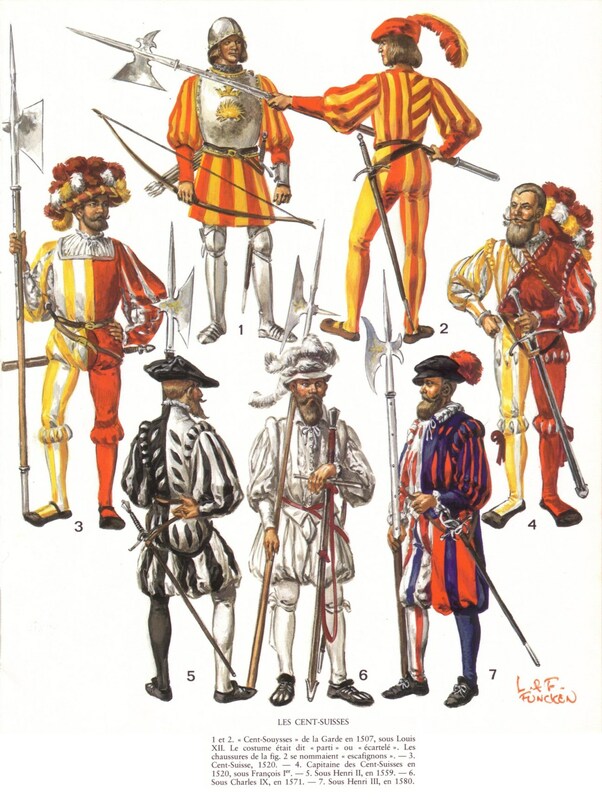 Firearms developed rapidly in French infantry formations from the 1520s, bow- men still being common in 1521, and Piedmont provided an important impetus. When Francis I issued an ordinance for the French and Italian infantry in 1537, he specified a maximum of one quarter of any company to be armed with guns, though it seems that this was more a measure of control for the Italian companies, which were notably dominated by firearms, at around 70%. By the 1540s French infantry companies were also very heavily reinforced by firearms. Piedmont was the area in which this happened earliest, since local regulations assumed that campaigning there required a preponderance of firearms in a company, sometimes 80-90 against 30 pikes. The vidame de Chartres claimed that he had led north- wards a force of arquebusiers from Piedmont in the aftermath of Saint-Quentin because, in his opinion, the main advantage the enemy had was in his Spanish arquebusiers, whereas pike-men could be raised easily in France and Germany. By the end of the 1550s, then, arquebusiers were as common in the north, where the typical proportion in a company equipped with firearms was now half-and- half. 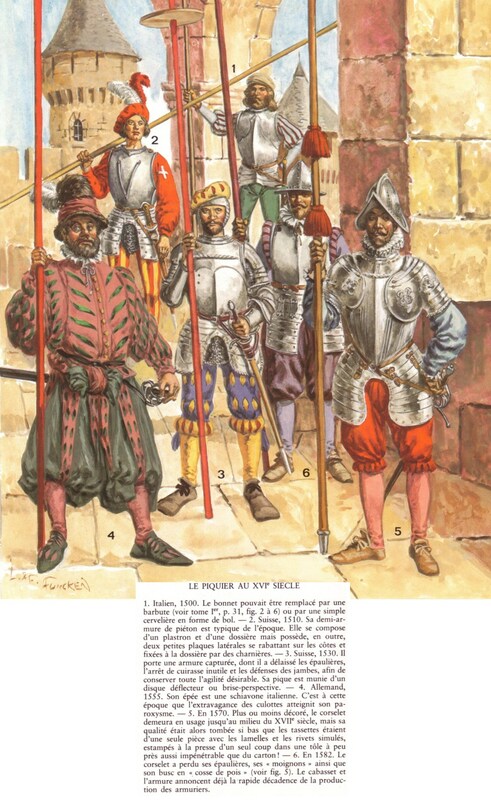 However, the ordinance of December 1553, specified that there should only be 58 arquebusiers in a company of 280 of the new bands and 97 in a company of 270 of the old bands, while the garrison companies were to be one third arquebusiers. There were some problems in that infantry had carefully to balance the offensive capability of firearms and the flexibility of pikes. If there were too many arquebusiers in a company, they were exposed to attack. In a formation, the arquebusiers had to retire behind the pike square while reloading. Infantry with firearms required greater training and discipline and was also more vulnerable to breakdowns in the supply of powder and shot. Fourquevaux naturally approved of the arquebus, though only in trained hands. His doubts were raised by what he thought was the desire of too many soldiers to be arquebusiers, either for higher pay or to fight at a distance. He thought that there should be fewer and better. The effect was often just noise, since sometimes for 10,000 shots not a single enemy was killed. He also had some regard for archers and crossbow-men, who, he thought, could serve well in bad weather, when arquebusiers were out of action. Unlike the earlier wars with France fought under Henry VIII and Edward VI, the war of 1557-1559 was not initially an Anglo-French conflict but a Franco-Spanish war in which England became involved as Spain’s ally. The English were reluctant combatants; Philip II of Spain, husband of Mary I, put pressure on the English government to join the conflict, but Mary’s council decided on war only after a series of French provocations. Although favorable to Spain, the outcome of the war was disastrous for England, which lost Calais, its only remaining continental possession. The French royal House of Valois and the Spanish royal House of Habsburg had been intermittently at war with each other since 1519. The hostilities that began in January 1557 between Henri II of France and Philip of Spain constituted only the latest phase of that struggle. Although joint ruler of England, Philip could not automatically take the realm into war. The marriage treaty that united Philip and Mary in 1554 limited Philip’s authority in England and denied him English military assistance unless the English queen and council agreed to provide it. Although popular with the English nobility, who sought profit and advancement through service to Philip, the war was highly unpopular in the country at large. The English commons, and especially the merchants of London, did not relish fighting or paying for a war begun to further Spanish interests. Philip, therefore, made little progress in persuading his wife’s kingdom to enter the conflict until a number of threatening French actions, culminating with Stafford’s Raid, an apparently French-backed descent on the English coast by a dissident Englishman, convinced the council of Henri’s hostile intentions. England declared war on France on 7 June 1557, and by late July an English force had joined Philip’s army at the siege of Saint-Quentin. On 10 August, the allies decisively defeated a French relieving force outside the town, which capitulated on 27 August. The English fought credibly, sustaining more than 200 casualties before returning home in November. The defeat at Saint-Quentin left Henri in need of a victory, which Francis, Duke of Guise, secured with a surprise attack that captured poorly defended Calais in January 1558. Having ignored warnings of Guise’s intentions, the Marian regime, already unpopular thanks to its policy of burning Protestant heretics, was further discredited by the fall of Calais. Although Philip won another victory at Gravelines in July 1558, the battle had little effect on the peace talks that had begun the previous May. The talks were stalled by the English demand for the restoration of Calais. However, the death of Mary and the accession of Elizabeth I in November released Philip from any obligation he felt to support English interests. As a result, Cateau-Cambrésis, which was concluded in April 1559, left Calais to France. Although bitterly disappointed, Elizabeth was forced by French hostility to remain on friendly terms with Philip. THE TREATY OF CATEAU-CAMBRÉSIS (1559). Cateau-Cambrésis is a town in northern France where a treaty was signed ending the last English foothold on the Continent. On 2 April 1559, Henry II of France (ruled 1547-1559) accepted terms that brought the Habsburg-Valois Wars to a close. After a truce in 1556, war had resumed in 1557 and subsequent successes helped determine the nature of the peace. The Spanish forces that invaded France from the Low Countries in 1557 won an important victory at Saint-Quentin (10 August 1557), when a relieving army for the besieged fortress was heavily defeated. In the battle, the Spaniards made effective use of their cavalry, especially of pistoleers, in which they outnumbered the French. Philip II of Spain (ruled 1556-1598) organized the campaign that led to this victory and followed it up by leading the successful storming of Arras. The following January, however, French forces bombarded Calais, England’s last foothold on mainland France, into surrender in a campaign characterized by bold French generalship: Mary Tudor, queen of England (ruled 1553-1558), was the wife of Philip II, and she had declared war on France in June 1557. The French pressed on to try to take Dunkirk by surprise attack, but they were defeated at Gravelines on 13 July 1558. The Spanish pistoleers again outnumbered their French counterparts; they both won the cavalry fight and hit the French pike, who were also affected by Spanish harquebus power. Aside from being defeated in battle, Henry II was also bankrupted by the heavy cost of the war and alarmed by the spread of Protestantism in France. The ability of the Spaniards to advance into France meant that Henry could not finance his army by ravaging the Spanish Netherlands. The Religious Peace of Augsburg of 1555, in which Henry’s German allies had settled their differences with the Habsburgs, had also weakened Henry’s position. As a result, he accepted a treaty that left France bereft of what her monarchs had fought for since 1494. Spain was left in control of Milan, Naples, and Sicily, the key positions that established Spanish power in Italy, and that at a time when Italy was the center of the Christian world. In addition, the French had to yield their positions in Tuscany, which was now securely dominated by the Medici rulers of Florence, allies of Spain, while Savoy and Piedmont, which France had seized in 1536, were returned to Duke Emanuel Philibert of Savoy, a Spanish client. The French, however, kept Calais, and this marked the end of the pursuit by English monarchs of territorial gains in France. French failure ensured that there was no reversal in the Peace of Cateau-Cambrésis of the removal (by treaties in 1525 and 1529) of Artois and Flanders from the suzerainty of the French crown. This was the first major retreat of the French crown from the frontier originally designated in 843 when Charlemagne’s inheritance was lastingly divided. The frontier between the Valois and Habsburg territories in the Low Countries had become that between France and the empire. This settlement was not to be seriously challenged until the 1640s, in large part because of the weakness of the French monarchy after the death of Henry II following a jousting accident in 1559. This, indeed, ensures that Cateau-Cambrésis is well known, whereas earlier peaces between Philip II’s father, Charles V, and French monarchs, such as the Treaty of Madrid (14 January 1526), the Treaty of Cambrai (3 August 1529), and the Peace of Crépy (18 September 1544), are largely forgotten. However, had Henry lived, or been succeeded by another vigorous monarch, France would have tried to contest the settlement. Indeed, in 1572, Gaspar de Coligny, the Huguenot leader, sought to unite France behind a plan for intervening against the Spaniards in the Netherlands. This was preempted when Charles IX turned against the Huguenots, but the policy was to be resumed by Henry IV (ruled 1589-1610). Cateau-Cambrésis should therefore be seen as a stage, not a definitive settlement.